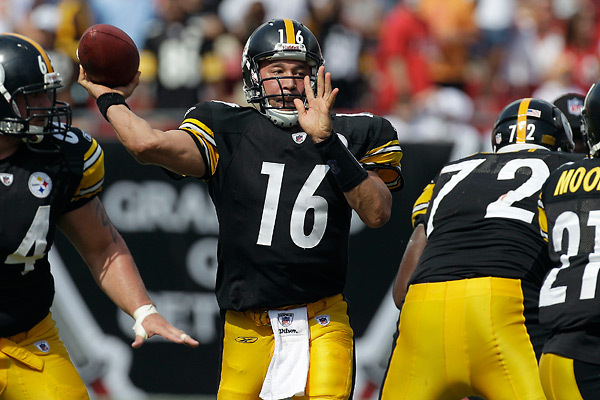 He didn’t practice all week, and since last week the Steelers were not able to take advantage of a chance to grab the one-seed in the AFC, the team this week will sit QB Ben Roethlisberger in place of Charlie Batch. The team made the call today, deciding it would be better for Roethlisberger to sit against the Rams tomorrow in a 1pm game at Heniz Field. Roethlisberger was not happy with the call to sit in the teams 15th game of the year. Center Maurkice Pouncey, running back Mewelde Moore, wide receiver Emmanuel Sanders and defensive back Curtis Brown are all ruled out for game, and along with Roethlisberger, linebacker LaMarr Woodley is questionable. 6 Comments on "Batch To Start at QB For Banged Up Ben Roethlisberger Saturday"
I totally agree . Batch is no Roethlisberger but if we cant beat a 2-12 team in our own back yard then we may as well hang it up anyway . Ben needs to rest and the week off will do him well . i have a terrible feeling about this game. Don’t trust Arians to have the offense ready to go and combine that with glass-jaw Batch running the show? Recipe for disaster. Plus we are a banged up football team. Maybe Harrison will come out and have 4 or 5 sacks and we win with defense 13-9. I don’t think so though. I think we get beat today…crap. Does ‘sit’ mean Ben R. won’t dress, or merely won’t start? I presume he could play if things get ugly. But if Arians scripts a game plan Batch can execute (throw short, run the ball), we will be all right. Speaking of running the ball, who is backing up Redman if Mendy and Moore can’t play? Or is Mendy healthy enough to play? Anyone know? I presume Batch was chosen over Dixon because of his experience, but with this O-line, I’d think Dixon’s mobility would be an attribute to be considered. Dixon’s frequently expressed wish to be traded must weigh against using him. And if Dixon can’t beat out a 37 year old QB for the back up spot, where in the NFL can he play? I guess Batch wasn’t as bad as you all thought ? How quickly we forget who it was that brought the Steelers through the first 3 or 4 games last year when Ben was suspended. Sad how some so called fans will turn on their own team so quickly!!!! Why can’t we just support our team, win, lose, or draw?